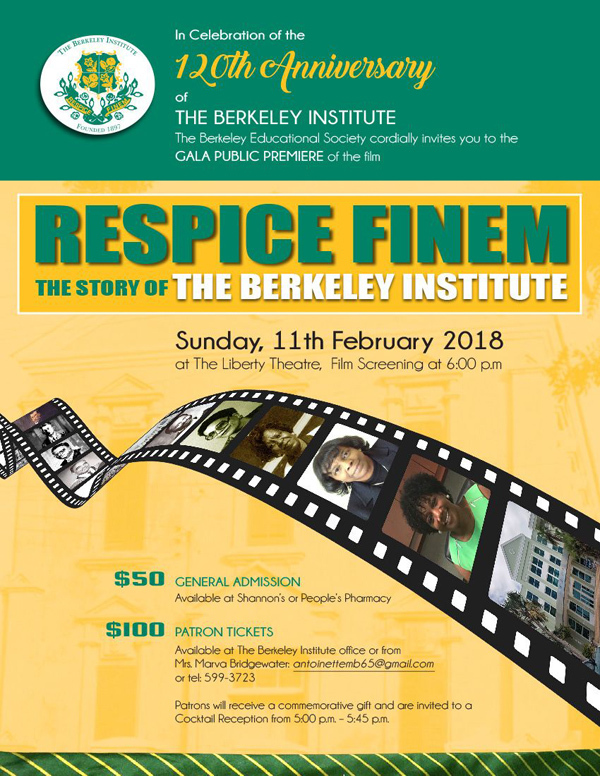 The 120th Anniversary Committee of the Berkeley Educational Society said they are pleased to announce the Gala Public Film Premiere of “Respice Finem: The Story of The Berkeley Institute” on Sunday, February 11th, at Liberty Theatre beginning at 6pm. “Respice Finem” was commissioned and produced by the Berkeley Institute Class of 1963 as an alumni class project to commemorate their 50th year as Berkeley graduates,” a spokesperson said. “The Class of ’63 had its own proud premiere of the film on November 21, 2015, and it was also shown at the Bermuda International Film Festival on March 5, 2016 at the newly-named Earl Cameron Theatre in City Hall. “The “Respice Finem” film was directed by Lucinda Spurling, Karli Powell and Kara Smith. The creation of “Respice Finem” was partially funded by The Berkeley Educational Society and the film was officially handed over to the Society in November 2016, a year after its official launch. “Head on down Memory Lane by reminiscing alongside fellow Berkeleyites featured in the film and also contribute to this worthy fund-raiser. “Tickets are $100 for patrons and $50 for general admission. Patron tickets are available from bdatix.com, The Berkeley Institute office [Ms Anderson] at 292 4752, and from Mrs. Marva Bridgewater, e-mail address antoinettemb65@gmail.com, telephone 599 3723. General admission tickets may be purchased at Shannon’s in Windsor Place Mall, 18 Queen Street [292 5349], and at People’s Pharmacy, 62 Victoria Street [292 7527].